I'm headed back to the U.S. tonight (actually early Friday a.m.) for Passover and to see my family. Will post after I return. Roberta, Jonathan (shown above at the entrance) and I went to the Jewish cemetery. It has been moved a couple of times, most recently in the 1980s, and is located in a bustling area, down a narrow street, a couple of kilometres from the new City Centre shopping building on the one side and from the beach on the other. Next to the Jewish cemetery there is a Chinese cemetery and a Bahai cemetery, carved out from the same general area. Other than being overgrown with weeds and tomato plants (which are cleaned out every few months by the caretaker) the graves were in decent repair, aided by a 12 foot high wall that was built with funds from one of the Jewish aid societies in North America. There are less than ten gravestones---the oldest from the 1700s and the most recent the caretaker's stepmother, buried in the late 1980s. Besides the Salomon family, who were merchants in the 1700s, the others are more recent and somewhat random (varying dates and names), including a young European woman (1920-1943) who may likely have been a refugee from Germany. But, from the dedication marker below dating from 1901, it is clear that much of the Jewish community of Madras had already disappeared by the turn of the last century, since the state of the cemetery even at that time needed oversight. In previous posts I have written about Marty's and my trip to Bombay for the High Holidays, and visits to Cochin to visit the old synagogue there and what remains of Jewtown. Here in Chennai, there is no indigeneous Jewish community, only a cemetery with a very sad history that dates from the time of the East India Company. However, as everywhere, even a small Jewish community will manage to find itself together, and that is what happened last night when Roberta and I were invited to our friend Rochelle's house to meet two young people, Lindy and Jon, who have recently relocated to the city. 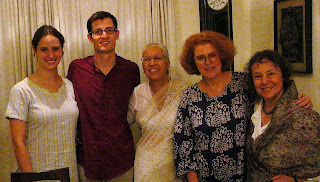 Rochelle, who you see in the middle of the picture, has been in Madras for over 50 years, moving here with her husband from Bombay in the 1950s. Her family is originally from the B'nei Israel community in Pune, near Bombay, but she grew up in Hyderabad, where her father had a cinema business. During World War II, refugees from Europe, turned away by other countries, found their way to India, and a number of them came to Hyderabad. Usually they found their way to Rochelle's parents house. Rochelle's father died when she was a child, and every day her mother went to the small cemetery in Hyderabad where the Muslims (Hyderabad is a heavily Muslim city) had given over a small portion of their own cemetery for the Jews to use. There were only a couple of dozen graves there, and the one next to Rochelle's father was that of a European woman--which Rochelle's mother, out of a sense of obligation, tended along with her husband's. Decades later, Rochelle happened to be at party in Madras and sat down next to a foreign woman who was visiting the city. After chatting, they discovered not only that they were both Jewish but that the woman's parents had been in Hyderabad during and after the war. If you are Jewish (and probably even if you're not), you know the rest of this story---the European woman buried next to Rochelle's father was none other than the foreign woman's mother. There is a Jewish cemetery in Chennai, though as noted above it has a sad history. It was originally located near the beach, and about 40 years ago, the land was needed for other purposes and the cemetery was about to be razed. At that time, there were a number of other Indian Jews living in Madras, though all of them but Rochelle have since moved to Israel, died, or gone to other cities. This group met and tried to decide what to do. They were successful in persuading the government not to destroy, but remove, the graves to another spot. However, the new location is poorly tended and it is a constant struggle to maintain. One day, Roberta and I plan to visit it and see for ourselves. Roberta and I went to Singapore for her birthday, and had a lovely time at the orchid gardens. A different set of orchids was in bloom than when Marty and I visited a year and a half ago, but still beautiful. We also went to the Jurong Bird Park, which has several hundred varieties of birds from all over the world. A couple of times a day, there is a bird show, where trained macaws, flamingoes, and even hawks entertain a fascinated audience, flying through hoops in formation, retrieving money from members of the audience, and even playing ping-pong. There is a "Lory loft" where brightly colored birds (see below) drink sugar water from cups supplied by the park attendants. One poor little girl was nipped by an eager bird trying to cram his way onto the feeding cup. But for the most part, the birds were well behaved, as were the children. BSNL came and got the internet working (turns out it was a faulty phone connection), but my home laptop crashed and despite reloading Windows, the ethernet driver is nowhere to be found, and the computer is still very, very slow. So, plan to invest in a new one shortly. Fortunately, I had backed up MOST of the photographs I've taken over the last two years--though I'm sure I'll discover some good ones missing. Today is Holi, a primarily North India holiday that is a spring festival of colors---you see both people and cattle decorated with face paint and colorful dress. There are various stories about the origin of this holiday, in which vibrantly colored powders with medicinal properties ward off the viral diseases and colds so common in spring. Coincidentally, it is also the Jewish festival of Purim, which celebrates the defeat of the Haman, evil aide to the King of Persia, who plotted to destroy the Jewish people. I missed hearing the reading of the Megillah (Book of Esther). Sara went as an Indian princess in her latest salwar kameez!